Originally premiering on Frank Ocean’s “blonded Radio” show on Apple’s Beats 1 network, A$AP Mob’s ode to fashion designer Raf Simmons finally gets a visual. Although, probably not the one fans were expecting. Let’s start with how the full version of the “Raf” track includes the whole A$AP crew including Rocky, Playboi Carti, Quavo from the Migos crew, Lil Uzi Vert and Frank Ocean. A pretty stellar lineup and all their verses worked well together. I don’t know what took them so long to make a music video for this dope track, but after watching the full visual it wasn’t hard to figure out the answer. The video features A$AP Rocky and the Mob, Playboi Carti and Quavo modeling both new and rare, limited edition pieces from the Raf Simmons archives. There’s a low-resolution style on the film making it look like it came from somewhere in the mid 90’s. Also, the whole video can be easily categorized as a “visual lookbook,” obviously lining up with modern fashion docs. The absence of Lil Uzi Vert and Frank Ocean is sadly what made the visual just average, mainly because their verses on the track were fire. But we get it, trying to get all those talents in one recording lot is probably no easy task, which is probably why it took so long for a visual to come to fruition. 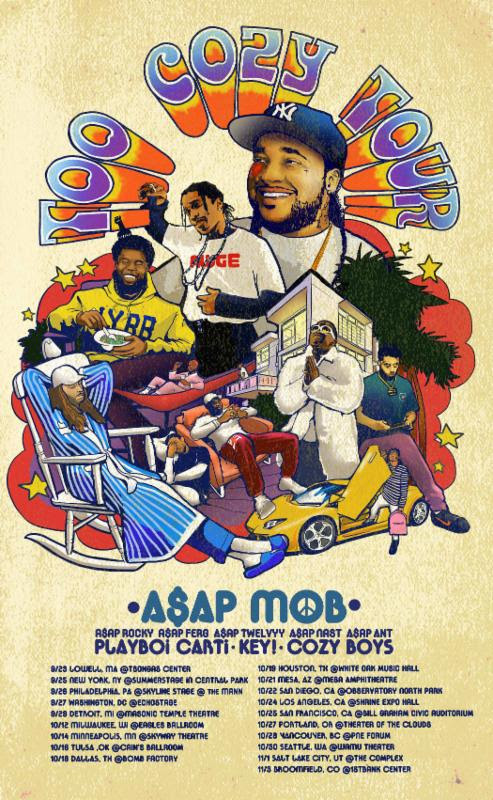 Next up, check out the city lineup for A$AP Mob’s fall tour.